Ideal for residential, commercial and industrial buildings, the LKC-1500 comprises a leak detector controller in a DIN-rail mounting enclosure and up to 1500m of leak sensing cable. The controller is able to detect a leak and indicate its position as a distance along the cable from the controller. 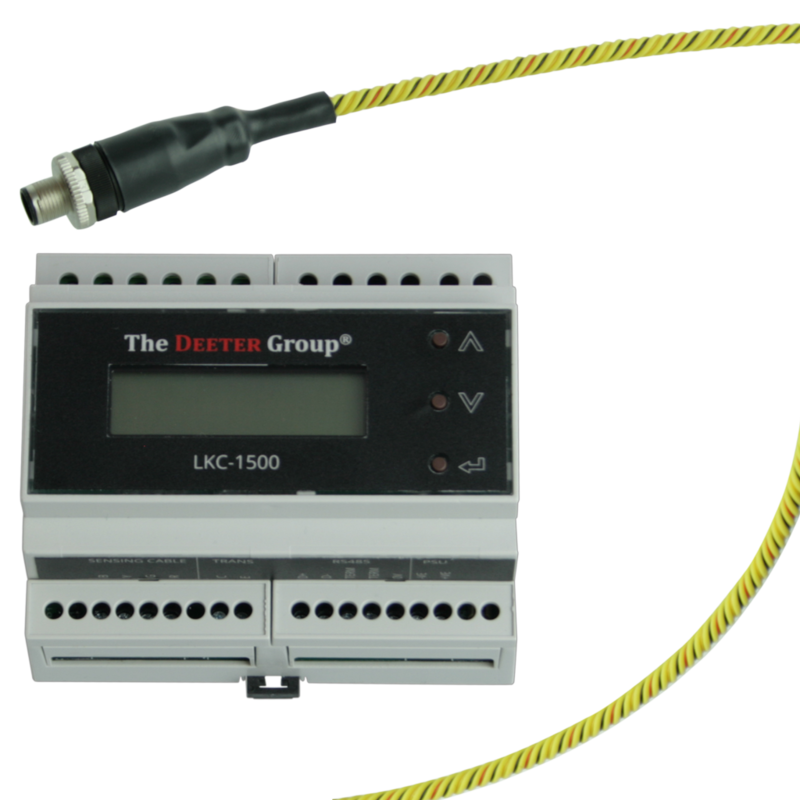 The LKC-1500 Controller can be used in conjunction with the deeternet® Wireless Gateway to provide the user with constant monitoring of their system. This system can be configured so that whenever a leak is found in the system, alerts can be set to provide notifications via email or SMS of the location of any leaks so that they can be dealt with as quickly as possible. When the deeternet® wireless gateway is connected to a LAN, users can actively monitor the current status of all LKC-1500 controllers within the system using any device with access to the LAN, the deeternet® wireless gateway can be used in this way to monitor multiple LKC-1500 controllers at any one time. The LKC-1500 controller has an LCD and three push-button switches to enable the user to access option menus and select from a variety of programmable features. During normal operation the display shows system status or the location of any leaks. Power to the controller can be from a mains supply 210-250VAC, 50Hz (105-130Vac, 60 Hz US version) and can also be powered from 10-24Vac or 12-32Vdc through the low-voltage supply terminals. The controller has a variety of process outputs including two SPDT relays to directly control mains powered pumps, valves or alarms, an open-collector transistor is provided for connection to a programmable logic controller (PLC), building management system (BMS) or for indirectly driving further valves or pumps via an external relay and finally an RS485 serial communications port for remote monitoring. The controller is capable of detecting a broken or improperly terminated sensing cable, relay and transistor outputs can be assigned to respond to a leak or to a fault. The length of sensing cable that can be used with each controller is between 15m and 1500m and the leak position is measured along this length of cable. The cables are terminated with a 4-pin DIN plug at one end and DIN socket at the other. A cable with a socket is required to attach the first length of sensing cable to the controller. The wires in this cable are colour-coded to match the terminals on the controller: B for blue or black, Y for yellow, G for green, and R for red.